*Corresponding author. Tel. : +92 3081661877; fax: +86 10 84659135. E-mail address: zunairaasif@uet.edu.pk (Z. Asif). Mining activities contribute the high level of air pollution at ground level and have significant environmental impacts. There is an urge to develop an integrated modeling system which helps to analyze these pollutants and their control strategies. Therefore, a new integrated approach is conceptualized as life cycle based air quality modeling system (LCAQMS) for the mining. 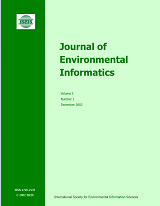 This paper focuses on incorporating air quality modeling to understand the severity of air pollution in mining and developing an integrated system for mining related decision support with a field application. The system integrates inverse matrix which is used to develop air emission inventory; characterization method to assess the environmental implications; artificial neural network model for carbon footprint analysis; air dispersion modeling to predict the pollutant concentration at receptor level; and multicriteria decision analysis tool to provide air pollution control solutions. The developed LCAQMS method has applied to a copper mining site in the US. Inventory results reveal that NOX and SO2 produced more as compared to the other pollutants for this site. The study also helps to quantify the carbon credits for the copper mine. Prediction of the four significant pollutants (PM10, PM2.5, SO2, NOx) at ground level have been further calculated and validated with observed values at seven different monitoring stations. The modeling results have supported selecting the best alternative management technology for the air pollution control. It indicates that the developed LCAQMS can serve as a useful tool to assess, predict and assist in the selection of environmental mitigation options for mining sites.